‘Tis the season to be lunching and this week, the crowd at Michael’s was celebrating the season with plenty of handshakes and air kisses all around the dining room. 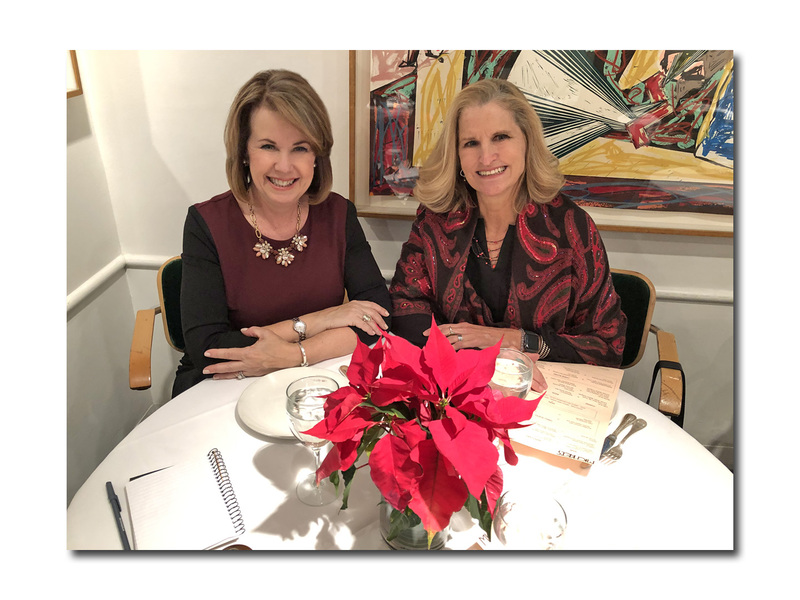 I was joined today by award-winning journalist Jeannie Ralston, founding editor and “adventurer-in-chief” of NextTribe, a digital magazine for women 45+ whose motto is “Age Boldly.” When Julie Livingston, who helms her own PR firm, WantLeverage, suggested a lunch for the three of us, I jumped at the chance. Ever since More magazine folded there really hasn’t been a magazine devoted specifically to women “of a certain age.” I was happy to see that Jeannie has, in the space of a little over a year and a half, picked up the baton with NextTribe, a website (or, as Julie says, “a digital magazine for the 21rst century”) that’s a hub of intelligent reporting and thoughtful conversation for those fortysomething and – gasp! – older women who just don’t see the point of reading any of the rapidly shrinking women’s magazines that celebrate 11-year-old, eleven-pound models. “Brands don’t want to be associated with older women,” said Jeannie. “But I think we’re pretty damn cool.” No argument there. Jeannie, who definitely qualifies as cool in my book, has assembled a chorus of smart, savvy voices to take on such topics ranging like “Angrier than you’ve ever been? 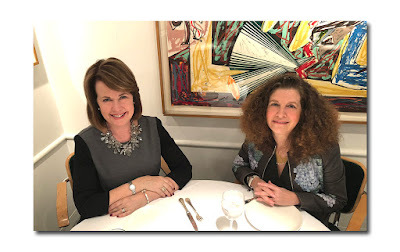 Here’s Why That’s a Good Thing” to “Modest Clothing for Women Over 50 is Back – But Why?” NextTribe speaks to its audience of “extremely engaged” women in a clear, knowing voice with just the right touch of humor. I asked Jeannie how she handles the hot-button issue of politics without alienating readers. “We do cover politics,” she explained. “We are pro-women all the way whatever that means.” In a recent reader survey, the overwhelming response was the site’s political tone was “just right” without veering too far off to either side. But biggest surprise from the survey, said Jeannie, was readers’ response to the question ‘What would you do if you had an extra hour?’ The most common answer: go outside or read a book. “That made me so happy,” said Jeannie. Jeannie told me NextTribe was born out a very personal need. When the younger of her two sons went off to college, she found herself at loose ends in her “empty nest.” Having relocated from New York City to Texas in 1991 with her husband National Geographic photographer Robb Kendrick, her life, up until that point, had been filled with adventure. She and Robb established Texas’ first-ever commercial lavender farm while living in Blanco. Then, after six years, they sold the farm and moved the family to San Miguel de Allende, Mexico where they lived for four years. A three-year global journey where they hopscotched from the Serengeti to Selma, Alabama (all while Jeannie was home-schooling her sons) resulted in the memoir, The Unlikely Lavender Queen and later, the e-book, The Mother of All Field Trips. And so, in February 2017 she “soft launched” NextTribe with a dozen articles written by Jeannie and a small circle of freelancers. “One of the great things about this age is that you’ve met so many people and have so many contacts.” In May of last year, she officially kicked things off with “a big party” in her current hometown of Austin. Jeannie, who does most of her work in her office from a stand-up desk, is NextTribe’s sole salaried employee (she has a business partner, Lori Seekatz) who takes multi-tasking to another level. She even did all the back office work herself launching the site from sizing the photos to implementing SEO. Now Jeannie’s got big plans of taking her show on the road (She’s already done a ‘Pop Up’ NextTribe Out Loud Celebrating Power & Creativity of Women Over Forty in New York) and focusing on producing more live events and travel experiences. NextTribe is making its debut at SXSW this year. When Jeannie sent in a video of herself pitching a panel on “How Mid-life Women Work Their Entrepreneurial Mojo,” she didn’t expect to be picked (Yes, you have to audition for a spot), but she was. In October, NextTribe hosted “Screw Invisibility” in New York City with panelists that included Kathleen Kennedy Townsend and drew an SRO crowd. (“We succeeded beyond my expectations.”) In 2019, there’s a NextTribe event scheduled for Los Angeles. “Right in the belly of the beast,” observed Jeannie. She has also started a pilot program in Austin for a community of 1000 readers led by a reader “brand ambassador” who get together periodically for different local events – something she is hoping to replicate in cities around the country. It was clear listening to Jeannie’s enthusiasm for NextTribe throughout our lunch that she’s found her next act. “I’ve reinvented myself several times. I always knew I’d have several different careers. It’s great fun to be having fun with your job! There are so many people at this age that aren’t having fun in their jobs.” And she’s not done yet. “I have so many ideas and am trying to do a lot of new things,” she said as she finished up her crème brulee and we said our goodbyes. “It’s just a bandwidth issue.” Jeannie, no doubt, will find a way. It was a festive scene at Table One with Margo Nederlander presiding over a table full of festively dressed gals (I think I spotted a pair of antlers on one of the revelers) celebrating the season … Andrew Stein on Table Two … Leonard Lauder left his perch at Table Four to greet fellow diners on Table Six including Varatan Gregorian … Allen & Co.’s Stan Shuman on Table Five … New York Social Diary’s David Patrick Columbia lunching with Gina de Franco, CEO of International Luxury Media. How swanky … PR princess Maury Rogoff, who always looks like she just stepped off the plane from Palm Beach, on Table Nine. How does she do it? … NBCUni’s Jennifer Geisser having a catch-up lunch with her old boss Discovery ID’s Henry Schleiff on Table 10. Jen worked for Henry back when he was the king of cable helming Court TV and making stars of attorneys-turned-talking heads like Nancy Grace. (I wrote Nancy’s first book, and that’s how we all know each other). Today, Jen even brought along an ancient artifact of that long ago age – a Court TV fleece – as a surprise gift for Henry … Literary lioness Esther Newberg on Table 11 … Ed O’Donnell on 12. 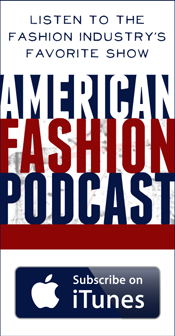 Moving On … Couturier Ralph Rucci on Table 15 with The Wall Street Journal’s Kristina O’Neill. It was great seeing Ralph, who I interviewed over ‘Lunch’ last year. This incredibly talented and lovely man will be making some big news very soon. Sorry, I’m sworn to secrecy … Alexandra Lebenthal lunching with some power gals I didn’t get to meet. Alexandra and I often trade recommendations on Facebook about television. I’ve joked there should be a 12-step program for Netflix addicts (Guilty!). She tells me I have to watch “Amazon in the Jungle.” I’ll just add it to the list! … PR maven Liz Kaplow was on Table 17 for the first seating. When Liz dashed back to her office, MSNBC’s Lawrence O’Donnell sat down with a woman we didn’t recognize. Anyone? 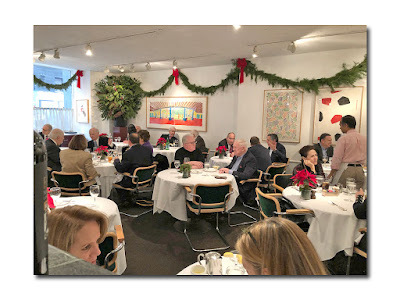 … CBS News president David Rhodes, who must be very busy these days, taking a breather on Table 18 … Joan Gelman with fellow producer Susan Gallin on 20 … Jack Kliger and Colman Andrews on 25. Jack recently sold British Heritage Travel (where I was a contributor), and I hadn’t seen him much since the deal went down. Did you know Jack is quite the wine collector and keeps some of his favorite reds here at Michael’s? Now you do. Jack and Colman, who are two publishing industry vets, were regaling me with tales of the days when there was such a thing in the advertising industry as ‘MCO’ – which means ‘Morning calls only’ referring to those executives whose three or four martini lunch made it impossible to see them in the afternoon. When Jack was the publisher of TV Guide (where I also worked for him), he happened to share this bit of publishing trivia with none other than Matt Weiner, the creator of “Mad Men,” who promptly took the idea and dropped into an episode. “I called him and asked ‘Do I get credit?’ and he said, ‘No, this is Hollywood!’” So today, I’m giving credit where credit is due … Directly across from my table (27), was marketing man and political analyst Robert Zimmerman, who was nice enough to introduce us to his godson, Alberto Means. Jeannie and Robert talked Texas politics before the guys returned to Table 26 to finish up their lunch.